VATICAN CITY (CNS) — People from around the world, especially the poor and the homeless, had a chance to send their good wishes for Pope Francis’ 80th birthday. Eight homeless people — two women and six men — made their way to the pope’s residence at Domus Sanctae Marthae for an early birthday breakfast, the Vatican said Dec. 17. The people, who hailed from Italy, Moldova, Romania and Peru, were accompanied by Archbishop Konrad Krajewski, papal almoner. “Pope Francis met with the them, greeting them affectionately one by one. The homeless gave the Holy Father three bouquets of sunflowers,” which he immediately placed in the residence’s chapel, the Vatican said Dec. 17. People from around the world also tweeted messages using the hashtag #Pontifex80 or sent email’s according to their preferred language, including Latin. According to the Vatican press office, more than 70,000 birthday emails were sent to Pope Francis, the majority of which were sent in English, Spanish, Polish and Italian. The Vatican also noted that over 1,000 birthday greetings were sent to the pope in Latin. Prisoners from the “Due Palazzi” prison in Padua, northern Italy, also had a chance to wish the pope a happy birthday via Skype. Father Marco Pozza, the prison’s chaplain, told Vatican Radio that he had arranged a Skype video call between Pope Francis and several inmates, guards and personnel from the prison. The prisoners thanked the pope “for your daily witness, which nourishes our hopes and our dreams,” Father Pozza told Vatican Radio. Thanking them for their “tenderness and closeness,” the pope gave his blessings to the inmates, personnel and their families. “God bless you all. I pray for you. I am close to you and I give you the Lord’s blessing,” the pope said. The pope also received birthday greetings from his predecessor, retired Pope Benedict XVI who sent “a handwritten and very affectionate message that was particularly appreciated,” the Vatican press office said in a statement. Pope Benedict also called Pope Francis and sent him “three small gifts which the Holy Father received as three very personal and significant signs for both of them,” the Vatican said. 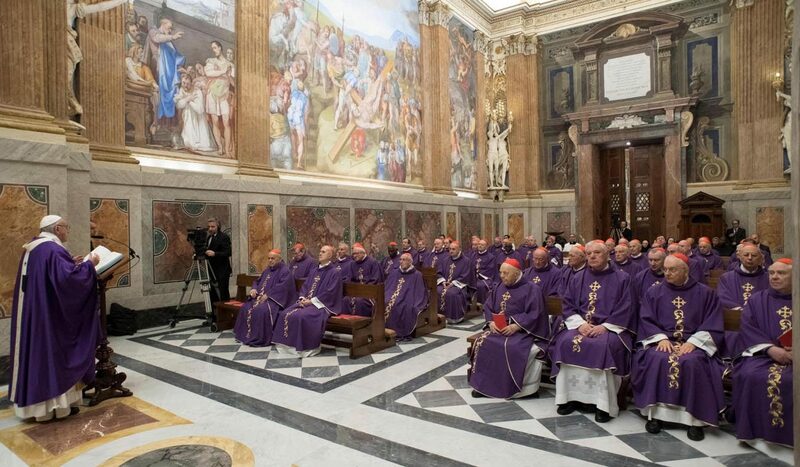 After his breakfast with the homeless, the pope concelebrated morning Mass with cardinals living in Rome. “The past few days one word that seems a bit awful keeps coming to mind — old age. It’s scary, at any rate, scary,” he said at the end of the Mass in the Pauline Chapel of the apostolic palace. With “the silent passage of time,” as Ovid called it, old age charges right at you. It’s a blow. But when one thinks of it as a stage of life that is for giving joy, wisdom, hope, one begins to live again,” he said. In his homily, the pope told the cardinals how important it was to remember the past in order to move forward in life better. Looking back one can see the beautiful people and gifts one has received from God and also one’s sins, which remind us how important God is for our salvation, he said. One can say in prayer before God, “I am a sinner but you can save me. You will carry me ahead,” the pope said.